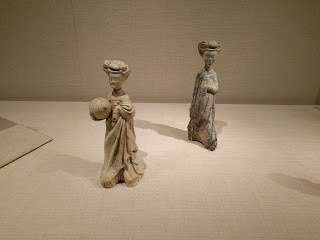 I took a trip to the Metropolitan Museum of Art in late September because I thought there was an exhibit on Chinese laquer ware that was going to close soon. I had the year wrong, it's opening and closing in 2017. Whoops. is holding happening in the SCA China facebook group, and I happened to be walking past the statue at the time so I took some video and helped answer the question. I also took a look at the scrolls section since I have friends who do beautiful calligraphy and are always looking for ideas. Pennsic was a whirlwind of activity, and despite me promising to update this blog "real soon I promise" life got in the way. I think this is a good time to take inventory of what I've figured out over the past year or so. There are a lot of unanswered questions, but I've made a ton of progress nailing down this process. Yeast Cakes I've got a recipe for "exceptional" yeast cakes that worked once, last year. But hey, it worked once. I also learned that the warning about "don't store this in a sealed container or it'll turn black and get gross" wasn't kidding, since my cakes did just that. Mr. Jia wasn't joking, apparently.